Elves are the Michelangelos of the fantasy world. Their artwork and crafts are so advanced that most races forbid elves to play Pictionary with them. That's why their weapons and armor are so sought after (their creative design, not the pictionary thing). This elven dagger continues the tradition of astounding elven designs. It's refined and sleek, decorated with leaf-style patterns and a subtle guard. The reinforced carbon grip is padded with multidensity foam and wrapped in a supple suede. 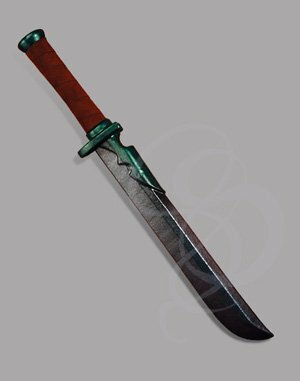 This is the ideal dagger for any elf, or any elf friend. Great for costume use, recreational pummeling of friends and neighbors, and of course, LARP (Live Action Role Playing). This dagger uses a round carbon-fiber core technology that makes this dagger astoundingly strong, flexible and springy. The cores feature special structural reinforcements around pressure areas like the joint between guard and blade. This prevents the weapon from breaking or folding at areas of high stress. The proprietary multi-density foam can withstand incredible amounts of punishment. This dagger also features a Vari-flex tip design which prevents stress on the tip and makes it almost impossible to cause creasing or weak spots that could lead to breaks.